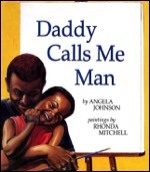 "Picture books are the nearest form of poetry that I can create on a regular basis. If it was up to me the only thing I would write would be poetry. I believe it is the essence of writing. The writing process is visceral and the gratification is immediate. 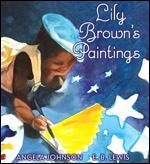 I continue to be enchanted with the mixture of art and poetry in picture books." This simply told story highlights such every day events as eating oatmeal and walking to the store, aptly capturing a small child's sense of pleasure in imitating an older sibling. It's love at first sight when the visiting zoo man asks who at school wants to hold a snake. 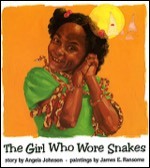 "Me," Ali says right off--and wears the snake all day. Later Ali buys all the snakes she can at the pet store and wears them all home. 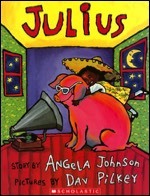 In this exuberant celebration of love and sharing, Maya is given an Alaskan pig and learns that friendship is a two-way street. 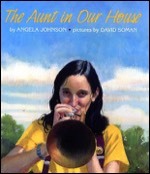 "The Aunt" comes to stay with the narrator's family, and "me and Sister" appreciate her mysterious presence. The siblings' parents are artists; their white father paints the woman's portrait while their African American mother teaches her to weave. Sara isn't too pleased about her new baby-sitter, Miss Alice. But Miss Alice has a few tricks up her sleeve--and several pairs of shoes on her feet. It's the story of a hero lost and a hero discovered, of a dream crushed then reawakened, but mostly it is a story of the force that sustains the human spirit -- hope. Lottie Paris' favorite place in the world is the library. Her imagination blooms there among the books (and the stars.) But when she meets Carl, who dreams of dinosaurs, it becomes the best place in the world. Lottie Paris may be precocious, but she still knows how to act like a kid. She dresses up, she plays on the slide, she eats cookies instead of vegetables. 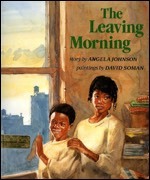 On the leaving morning, a child watches for the moving men, has a cup of cocoa in the deli across the street, and leaves lip marks on the window of the apartment before departing for the new home. "Since I can remember, I've been one of three. Eva, Nikki, and me." 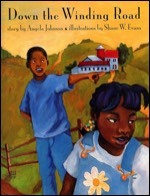 Narrated by the youngest child in a black family, this brief book focuses on the joy of being one of three sisters. Mama's memories of her own childhood have been told to her daughter so many times that the girl has made them her own bedtime litany; she tells her mother the stories and her mother reassures her that she has the story right. 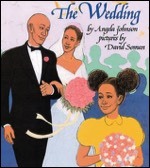 Daisy describes the preparations leading up to her older sister's wedding and the joyous and bittersweet feelings surrounding the event itself. 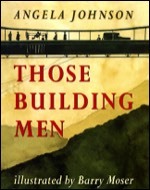 Johnson's poem muses on the men who moved the earth for canals, laid steel for rail tracks, cut down trees for building. A child recounts his great-great uncle's lifelong passion for flying-which began at age five with a leap from the roof of a chicken coop and climaxed with wartime flights as one of the Tuskegee Airmen. Lily loves the real world in which she lives with her parents and baby brother. But when she paints, her world is transformed into a magical place indeed. 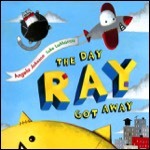 Ray is a parade balloon who longs to float far above the crowd, no strings attached. It’s his dream to fly on his own, though circumstances always seem to tie him down. The bond between grandparent and grandchild transcends time, and sometimes transcends an adult's sense of logic, reaching a deeper level of truth. 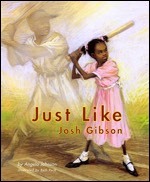 The story goes... Grandmama could hit the ball a mile, catch anything that was thrown, and do everything else -- just like Josh Gibson. 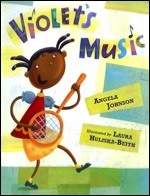 Bright, lively, and lyrical, this is a book for kids who march to a different drummer. There's a sweet, sweet smell in the air as two young girls sneak out of their house, down the street, and across town to where men and women are gathered, ready to march for freedom and justice. Inspired by his family experiences and his parents' paintings, a young boy creates four poems. While making beaded necklaces, baking cookies, decorating fans, and loading their wares onto a red wagon, an African-American girl shares her Granddaddy's story with her blond girlfriend. Jesse and his sister are city kids, so the journey into the country is amazing -- past sloe-eyed cows and emerald hills, under a cornflower sky.